For more than a decade, the IIASA Air Quality and Greenhouse Gases Program (AIR) has pioneered the analysis of the co-benefits of climate policies on local air quality and human health. Continuing this work in 2016, the program has fostered close collaborations with the energy research community, demonstrating that many solutions to reducing emissions and improving health lie within the energy sector. Air quality and climate policies can provide substantial mutual benefits: climate change mitigation actions can help reduce air pollution, and clean air measures can help reduce greenhouse gas emissions. In 2016, a collaborative project using the Integrated Model to Assess the Global Environment confirmed that, because of the overlap between greenhouse gas and air pollutant emission sources, climate mitigation policies have the highest impact on emissions of sulfur dioxide and nitrogen oxides, while their impact on black carbon (soot) and organic carbon emissions is relatively low. At the global scale, climate policy can have important co-benefits; a 10% decrease in global CO2 emissions by 2100 leads to a decrease of emissions of sulfur dioxide and nitrogen oxides by about 10% and 5% respectively, compared to 2005 levels . Energy production is, of course, central to both climate change and air pollution issues, and AIR has recently been working with the institute’s Energy Program, as well as a number of external energy modeling groups. The researchers explored various pollution control policies, complemented by climate mitigation policies that foster technology and fuel transformations in energy systems. The results showed that a combination of stringent air pollution policies and climate change mitigation could provide clean air to about 60% of the world’s population, with the largest improvements in India, China, and the Middle East. The study reinforces the importance of integrated policies that address multiple sectors in achieving the UN Sustainable Development Goals . The critical role of policy decisions in the energy sector to securing clean air was also the topic of a study undertaken with the International Energy Agency . Many solutions to reducing emissions and improving health and living conditions lie within the energy sector, the study confirmed. However, aging and urbanization will counteract the health benefits of policy measures, and even tighter measures will be needed if the aim is to reduce the total health burden in future. 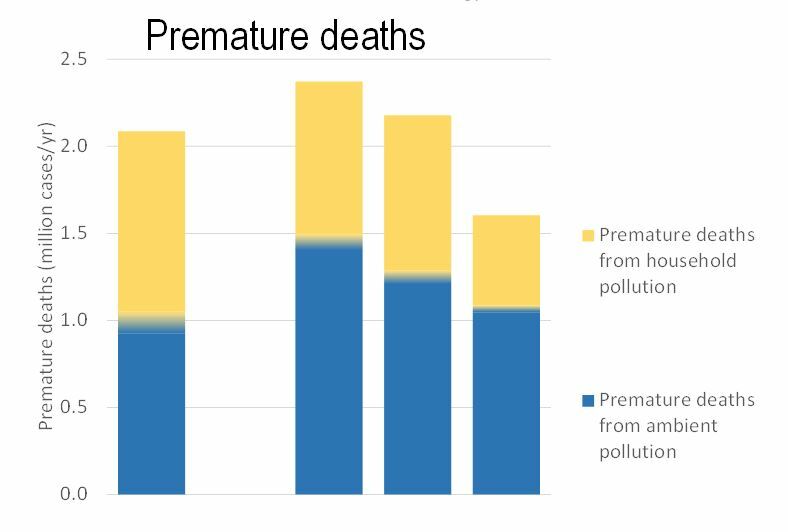 While recognizing that non-energy related sources make substantial contributions to air pollution, especially in developing Asia, the study demonstrated that a comprehensive ‘Clean Air’ approach, building on proven measures and policies, offers a cost-effective way for the energy sector to reduce health impacts from air pollution. Radu OB, van den Berg M, Klimont Z, Deetman S, Janssens-Maenhout G, Muntean M, Heyes C, Dentener F, et al. (2016). 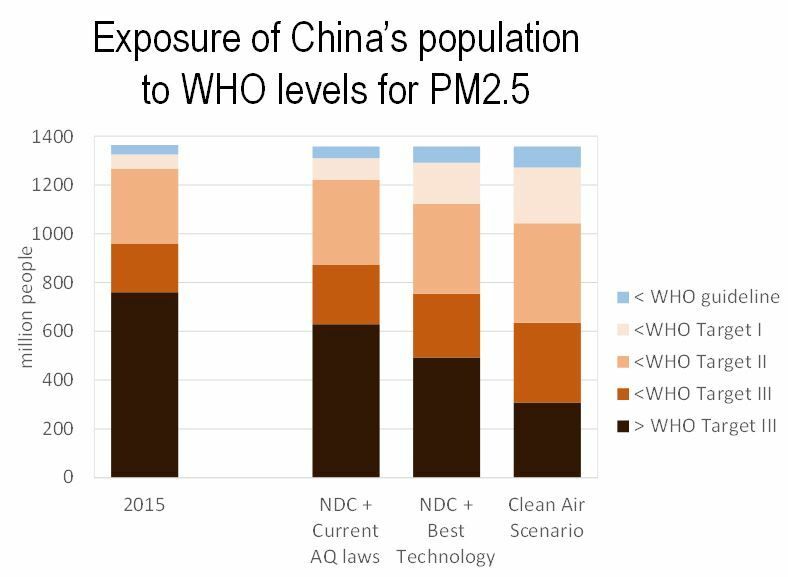 Exploring synergies between climate and air quality policies using long-term global and regional emission scenarios. Atmospheric Environment 140: 577-591. Rao S, Klimont Z, Leitao J, Riahi K, van Dingenen Rita, Reis LA, Calvin K, Dentener F, et al. (2016). A multi-model assessment of the co-benefits of climate mitigation for global air quality. Environmental Research Letters 11 (12): e124013. OECD IEA IIASA (2016). Energy and Air Pollution: World Energy Outlook Special Report 2016. International Energy Agency, Paris, France.